LRE Racing and JEH Racing Stable's Casa Creed, racing for the first time on turf, forged a short lead from stubborn pacesetter Royal Urn in deep stretch and held off fast-closing favorite Henley's Joy to upset Saturday's $100,000 Kitten's Joy at Gulfstream Park. 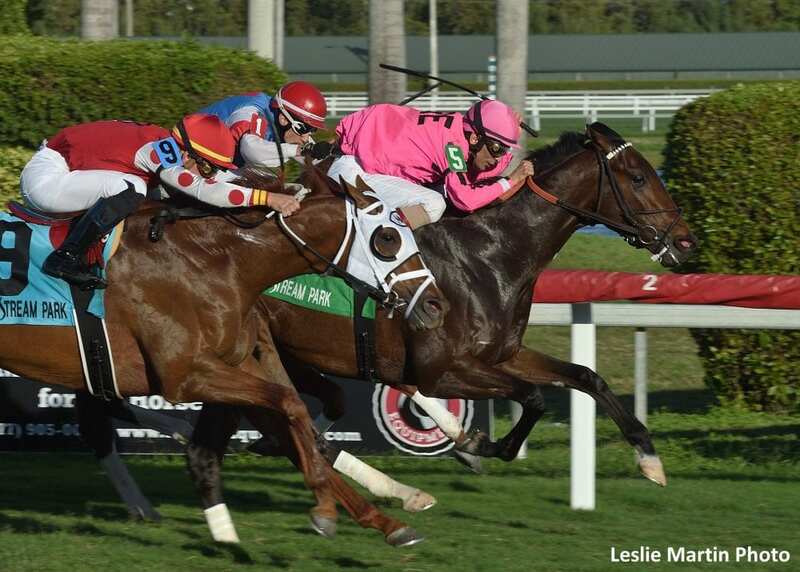 The 7 ½-furlong Kitten's Joy for 3-year-olds on turf was the fourth of five stakes worth $450,000 in purses on an 11-race program capped by the $100,000 Mucho Macho Man, the first of Gulfstream's series of races for 3-year-olds on dirt leading up to the $1 million Florida Derby (G1) March 31. Overlooked at odds of 12-1, Casa Creed ($27.40) completed the distance in 1:30.64 over a firm course under Hall of Fame jockey John Velazquez, who won the Kitten's Joy for the third time in its seven-year existence and first since 2015 when he also teamed with Saturday's winning trainer, fellow Hall of Famer Bill Mott. Casa Creed, a bay son of 2012 Malibu (G1) winner Jimmy Creed, had made all four of his starts at 2 on dirt, breaking his maiden in an off-the-turf sprint going seven furlongs at Saratoga. From there he was a distant seventh in the Champagne (G1) and capped his juvenile campaign similarly far back in the Spendthrift Juvenile Stallion Stakes Oct. 28. “He left us scratching our heads a little. His last two dirt starts were awfully tough spots,” Mott assistant Ken McCarthy said. “Bill was just looking to change it up one time. He said, 'Let's try it and see what happens.' We were just taking a shot, really. Royal Urn, one of three other horses in the field of nine with graded-stakes experience, was intent on the lead and held it through a quarter-mile in 24.58 seconds and a half in 49.03, pressed by Casa Creed while Henley's Joy rated between horses in fifth. Velazquez moved Casa Creed up to challenge the leader turning for home but 17-1 long shot Royal Urn was resolute and dug in while Henley's Joy was steered outside for a clear run down the lane. Casa Creed edged past Royal Urn nearing the wire as Henley's Joy came flying but fell short. Winner of the Pulpit Stakes Dec. 8 at Gulfstream, Henley's Joy was a neck ahead of Royal Urn, with 1 ¼ lengths back to stakes winner Louder Than Bombs in fourth. Moon Colony, Stirling Drive, Bourbon in May, Shazier and Dakota's Dude completed the order of finish. This entry was posted in Racing and tagged bill mott, casa creed, gulfstream park, Henley's Joy, jimmy creed, john velazquez, kitten's joy stakes, turf by Press Release. Bookmark the permalink.